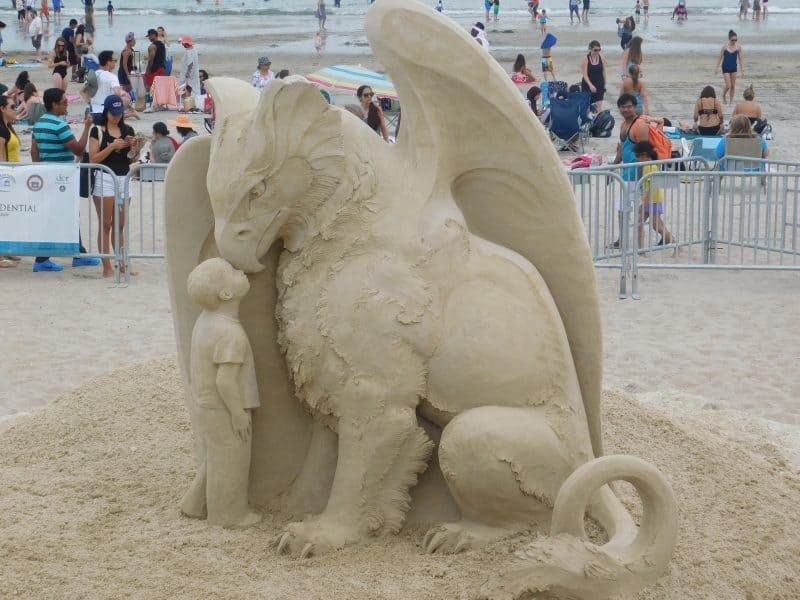 My favorite sculpture made by a sand sculpting artist at Revere Beach. Sandcastles To See…Food To Eat…Music To Hear…Can It Get Any Better? I was always one to mold tiny sand castles with beach toys as a kid. There’s a hidden joy in being able to stand back, pat your hands, and look at your tiny sand accomplishment before it gets washed away (or kicked over by your siblings). Crowds forming early in the morning at Revere Beach International Sand Sculpting Festival. 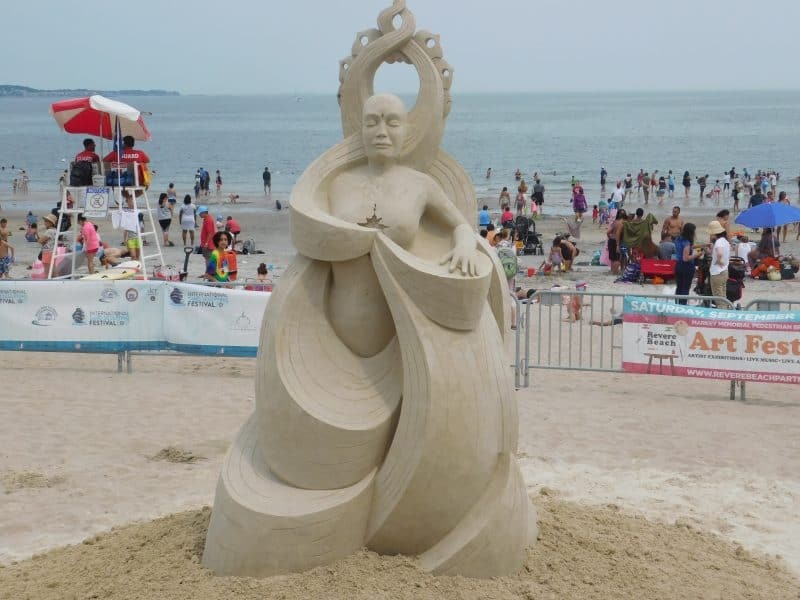 I’m guessing that’s how the Sand Sculptors at the Revere Beach International Sandsculpting Festival felt this past weekend after looking at their magnificent and time-consuming works of art. I have to give it to them, their castles are better than anything I’ve ever seen back in my plastic shovel and castle mold days. As an avid Boston-goer, I’m surprised I’ve never had the pleasure of visiting Revere Beach until the festival. Which is quite disheartening, given the fact that Revere has some of the cleanest city beaches in the world. They aren’t the most picturesque, but Revere and Nahant Beach are a perfect little place to for city folks to escape to, given its close proximity to Boston. I wasn’t sure exactly what to expect at the 14th annual International Sandsculpting Festival, but I can tell you I definitely was not expecting to see a perfectly sculpted sand 20-foot wide replica of the USS Constitution. Fitting with this year’s theme, Tall Ships, the replica was an ideal centerpiece and great way to kick off the festival. An artist working hard on his sculpture on Revere Beach. The event took place from Friday morning until 8 p.m. Sunday evening. A select group of sculptors traveled from all over the world and all walks of life to participate and compete in the competition. With up to $5,000 cash prize, it’s no wonder the world’s best sculptors travel from Italy, Lithuania, Canada, and many more countries. 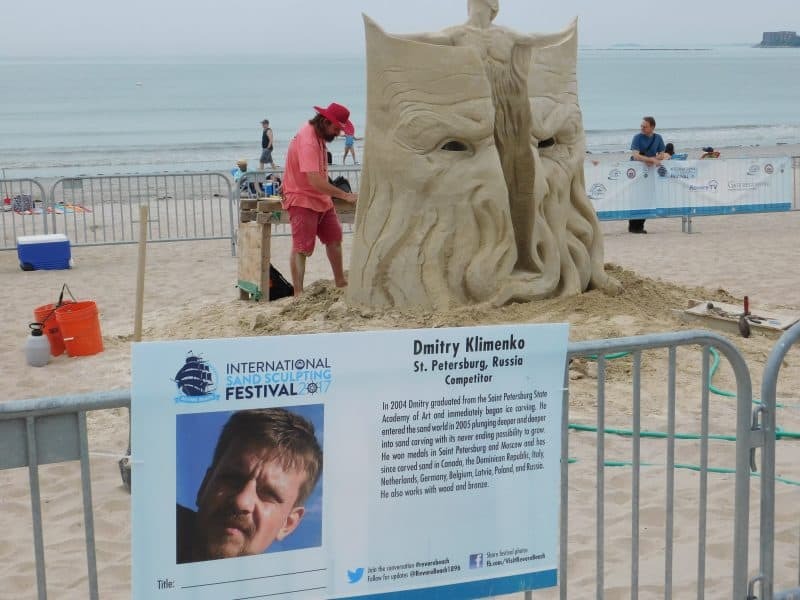 Using nothing but sand, water, and tools, fifteen artists took part in the solo competition where they received fifteen tons of sand and an 18’ x 18’ area to work on their sculptures. On a time crunch, they had from 10 a.m. on Friday to 2 p.m. Saturday to complete their work. With all eyes on them, they worked nonstop in the hot July sun. Their determination was evident, as they rarely took any breaks. As I walked down the street on Saturday morning, I was pleased to see not many people had arrived at the festival yet, that meant I could get an up-close view of the sculptors hard at work. Metal gates blocked off the public from getting too close to the sculptor’s work area, they seemed to be totally unphased by all the distractions around them. Deep fried…everything!? An all American peculiarity. Let’s not forget the most important part of any festival…the food. 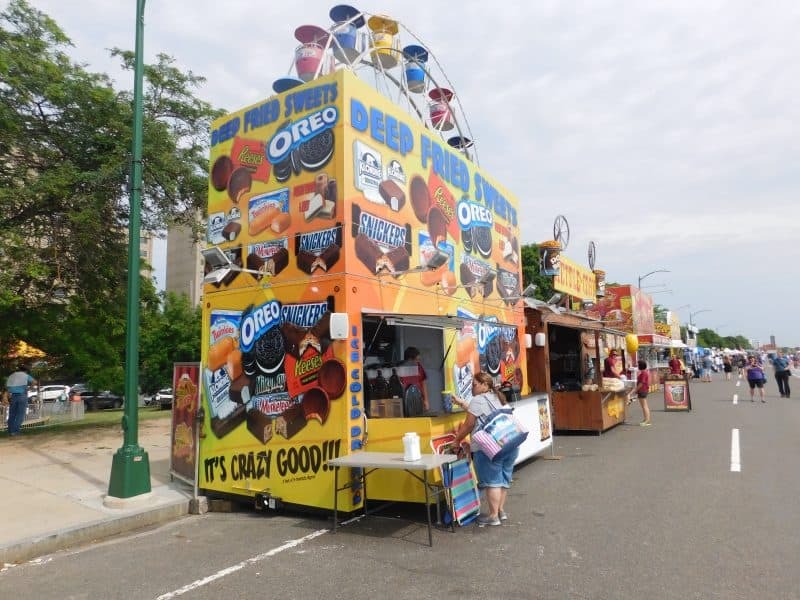 Dozens of food trucks lined Revere Beach Boulevard, the road directly across from the beach the sculptures were on. I couldn’t help but to feel overwhelmed by the options, should I get a burger from Boston Burger Company, a lobster roll from the Cod Squad, or even a hot dog from Trolley Dogs? 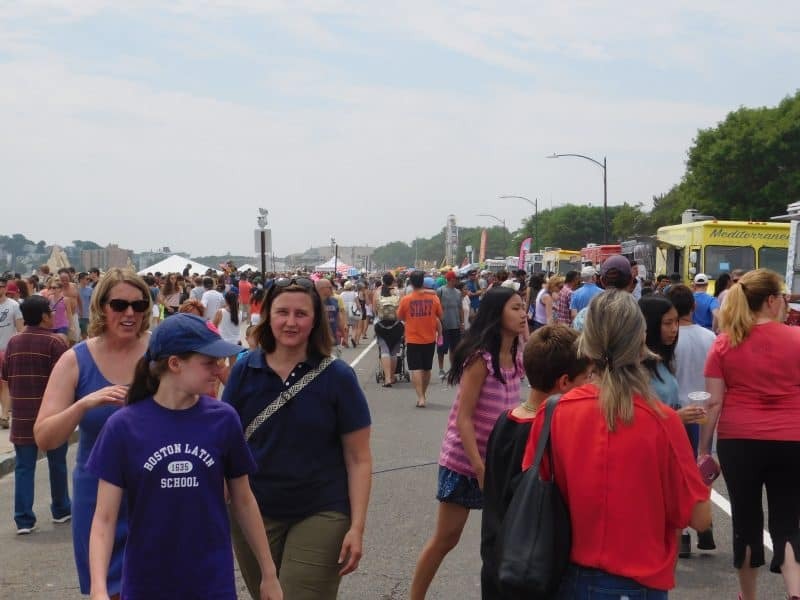 Hundreds of hungry eyes surveyed their lunch options, luckily the entire road was blocked off for the trucks, however, the area was still jam-packed. After walking up and down the beach strip twice, (that’s about a half mile of food trucks) I decided to buy a unique looking mug from Wild Bill’s Olde Fashioned Soda Pop Co.; the drink truck that allows you to manually fill your mug up, old fashioned style. Not to mention, I got free refills all day! 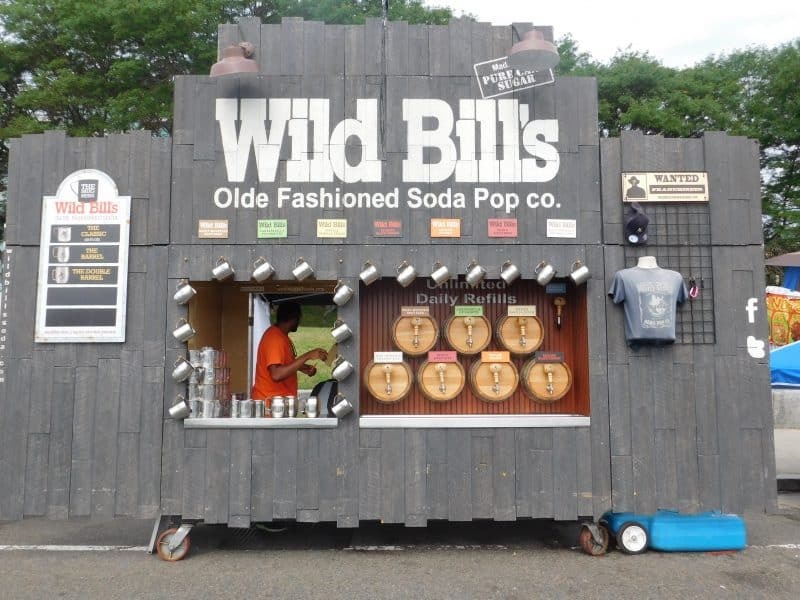 Wild Bills Olde Fasioned Soda Pop Co., I got a cool mug! 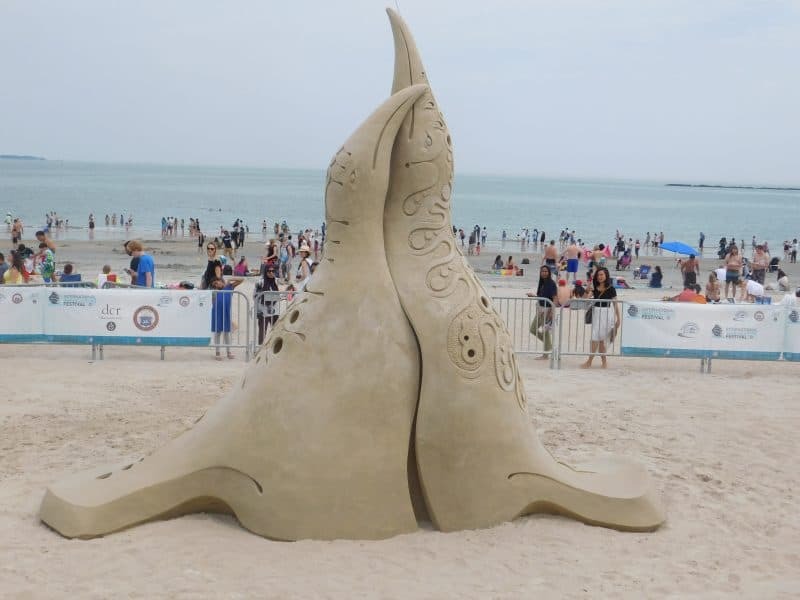 Apart from the sculptures, the festival also featured family-friendly activities, such as live music, a Ferris wheel, merry-go-round, a kiddie coaster, and free sand sculpting lessons. However, by far the BEST entertainment of the day was Ramblin’ Dan and the Professor World Band. 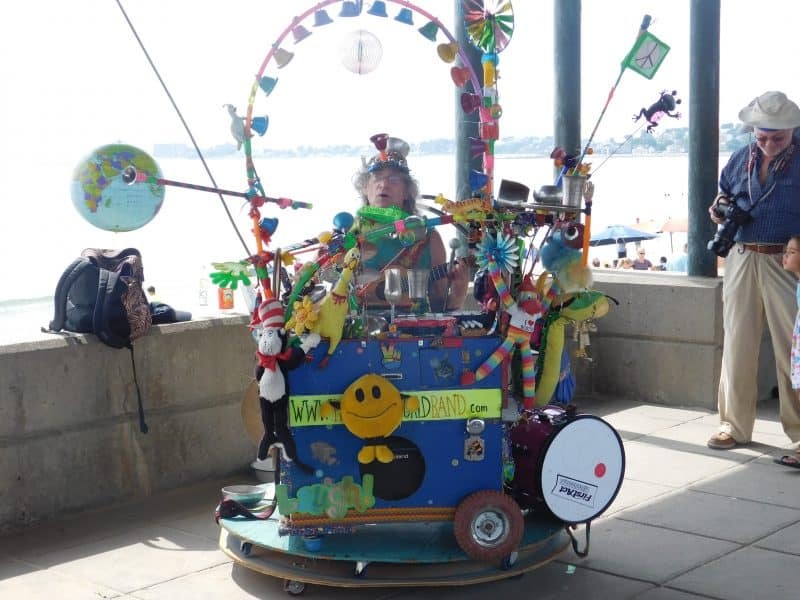 Underneath one of the beaches pavilions, a man who goes by the name Ramblin’ Dan was jamming out and singing songs on his wacky, colorful, rotating, music machine. As everyone around me was busy taking pictures, I was intrigued by the small binder laying on the ground next to him labeled, “My Travels”. The binder was loaded with pictures and stories of his travels to 39 countries as a one man band. There was something about this guy that brought a smile to everyone’s face, and you could tell, he was just as happy to be there. Ramblin’ Dans One Man Band playing his colorful music machine under the beach’s pavilion. As Saturday’s festival crept to an end, I felt a sudden urge, I NEEDED to find the best bakery in town. And that’s just what I did! As I desperately craved a cannoli, I ended up coming across a cute little hole-in-the-wall bakery called Torretta’s Bakery and Ice Cream, located on 652 Winthrop Ave.
Holy MOLY did they have some sweet treats. The best part of the bakery wasn’t just their fruit tarts or their sweet rum cakes, but the fact that it’s a family-run business dedicated to making authentic Italian sweets. Highly recommended for anyone with a sweet tooth. Of course, the festival had to outdo itself by ending the night with one of the most spectacular firework shows I have ever seen. Hundreds of people piled onto the beach to watch fireworks illuminate the sky above and reflect onto the ocean below. The show started at 9 p.m. sharp and I swear the entire city was there to watch. 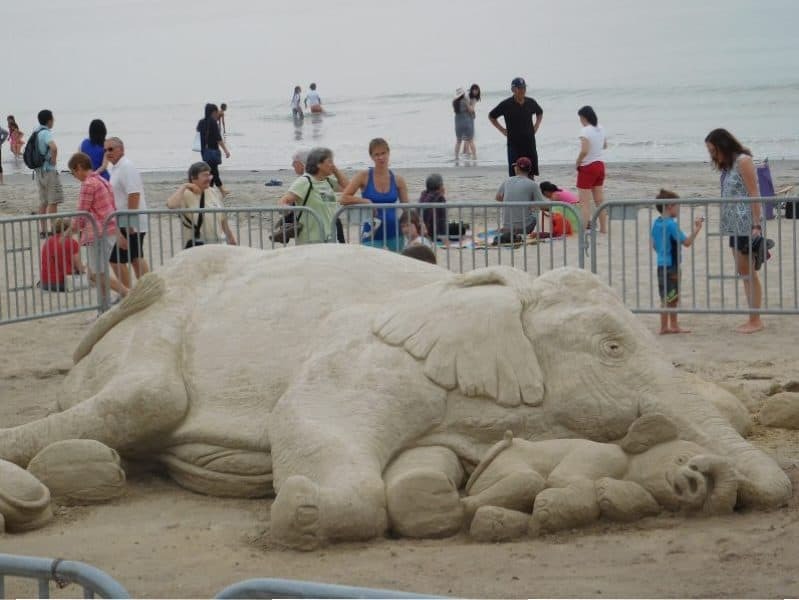 The crowds voted favorite…the elephant sculpture! Every beach strip, no matter where in the world, has it’s iconic fan favorite restaurants. Even without the festival and sand sculptures, Revere Beach is still an awesome place to visit. As a traveler who frequently visits new locations, I am always looking for spots a local would recommend. Fortunately for me, a list was provided to me with the best spots around Revere Beach! After speaking with Joe Gravellese of Mayor Brian M. Arrigo’s office, he recommended some of his favorite locations that every visitor should experience at least once in their life. I encourage you to use this list to your advantage…that whats its here for! Print it, save it, but most importantly, show some love to these spots by paying a visit! Another beautiful sculpture at the festival. 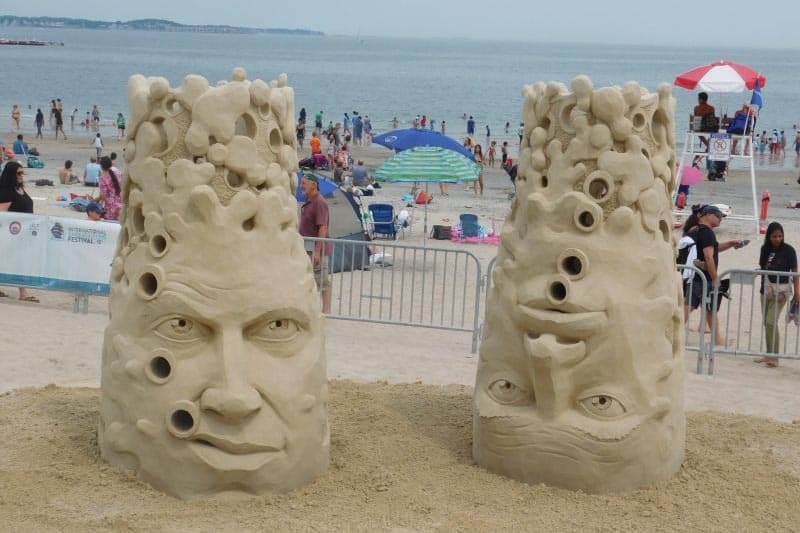 “Thmor Da Restaurant on Shirley Ave is one of my favorites in the city, and it’s a quick walk from Revere Beach and the sand sculpting competition. Homemade Cambodian cuisine – it’s fantastic. Try the Lok Lak or the Tiger Tears, plus one of the noodle dishes. So good. Casablanca House of Pastry also on Shirley Ave is a great Moroccan pastry shop and bakery. Really good. Banana Boat is a little dessert shack on the Beach (700 Beach St.) that has been serving ice cream and desserts for 50+ years. I used to go there all the time as a kid living around the corner. Kelly’s Roast Beef is the most famous spot on the Beach obviously and is well worth a visit. The Marina at the Wharf overlooks the Pines River near Revere Beach and is one of the city’s best new-ish restaurants. The kids were all going crazy over this one… a very cute sculpture. Bill Ash’s Lounge on the beach is a dive bar that is one of the last few that are still kicking, along with Sammy Patio. “The bathhouses and bandstand on Revere Beach are very cool. The bathhouses were once a place where people would rent bathing suits and other beach necessities back in the beach’s heyday. The clocks installed along the beach were put up to notify people of when their rental was expiring. It’s a little off the beach, but the Rumney Marsh Burying Ground is interesting history – it’s at 44 Butler St and is on the national register of historic places. Revolutionary War soldiers and revolutionary-era slaves are buried there along with some of Revere’s earliest residents. Not far from there is the Revere Public Library which is a Carnegie-era donated library, with beautiful, historic architecture. Rumney Marsh Reservation on the Revere/Saugus line is a scenic spot with opportunities for bird watching and other nature activities. There’s also a rail trail nearby that connects to bike paths up the north shore. If you have the time to just wander up and down the hills of the Beechmont neighborhood near the blue line MBTA stop – Crescent Ave, Leverett Ave, etc. – the views are just gorgeous. Old, colorful houses + great views of the beach down below once you get up to the top of the hills. Suffolk Downs is pretty much a dead zone at this point, only open for live horse racing 4-5 days a year; the rest of the year it has to simulcast of other races from around the country. But it’s a historic site and in and of itself – the Beatles once performed there, as did numerous famous race horses, including Seabiscuit.” said Joe Gravellese. Revere Beach is America’s first public beach, established in 1896. The 3-mile beach has convenient metered parking along the beach, and also a MBTA parking garage a short distance away. To get there via train, take the Blue line to Revere Beach or Wonderland. Olivia Gilmore is a travel enthusiast, writer, and cultural anthropologist who has traveled to West Africa and across the East and West Coast of the United States. As a member of Amnesty International, her interests include advocating for human rights, humanitarian volunteer work, and cultural immersion. She’s from Lunenburg, MA.